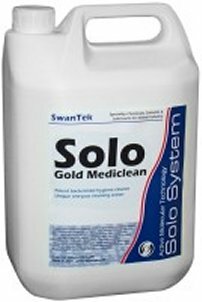 Solo Gold Mediclean is our ideal heavy duty sanitising cleaner for food and pharmaceutical plant and equipment. Quick and easy to use - works immediately to clean, disinfect, degrease, deodorise, sanitise to EN1276 standard. Tried, tested and proven for all hygiene cleaning. Safe to use on plastics and all common metals and paintwork. Recommended for all maintenance and hygiene cleaning, deep cleaning, disinfecting, regular hygiene mopping and spray cleaning. Solo Gold Mediclean is tested and proven to kill a broad spectrum of gram +ve and gram -ve bacteria including E. coli, Staphylococcus aureus, Pseudomonas aeruginosa and Salmonella typhimurium. For full test results click here. The powerful nonionic, cationic and amphoteric surfactants, and soil suspending and sequestering agents make light work of removing oils, fats, shortenings, blood, body fats and inorganic soiling. • Pharmaceutical manufacturing - cleaning walls, floors, plant, vessels, work surfaces, equipment, clean rooms, showers, locker rooms, drains. • Food manufacturing plants - cleaning walls, floors, ceilings, plant and equipment, cold storage, ovens, refuse areas, drains, vehicles, showers, locker rooms. • Food preparation areas - work surfaces, gulleys, ovens, extractor hoods. • Animal housing, vets surgeries, agricultural buildings, abattoirs - cleaning walls, floors, gulleys, ceilings, pens, cages, equipment, refuse areas, drains, vehicles. • Leisure centres, gyms - tiles, lockers, vending machines, kitchen equipment and surfaces, and all washable surfaces. • Can be used at dilutions from 300:1 in water for superb economy. • Powerful cleaning action guarantees better cleaning with less effort. • For use in both hard and soft water. • Odourless. Free rinsing. Non-tainting. • Non-fuming - no acidic or solvent content. • Combination cleaning and sanitising in one pass saves time and money. • Independently tested to kill many common food poisoning bacteria - for full test results of bacterial kill efficiency click here. For professional use only. The above information is given in good faith but without warranty and does not constitute a technical specification. For technical support and application guidance call 01539 722247. Technical specifications and certificates of conformity and analysis available on request. Can be used for all types of cleaning eg pressure wash, spray, wipe, mop. Can be used with hot or cold water. Safe for use on aluminium. Rinse with clean water - do not allow to dry onto surface being cleaned. To order call 01539 722247 now! For help with how to place your order click here. 1. Prices exclude VAT and are valid only for pack sizes stated. Prices subject to change without notice. 2. For volume discounts other than those shown above call 01539 722247. 3. Delivery is by TNT Next Day or our pallet carrier for all brands in stock. Standard delivery charge is £9.50. Additional charges apply for delivery to Scottish Highlands, Northern Ireland and offshore islands, and for timed deliveries, hazardous goods and branded lubricants. 4. All major credit/debit/purchasing cards accepted. Minimum credit account invoice applies. Tel: 01539 722247 HOME | PRODUCTS | TRACK ORDER | NEWS | ABOUT US | HELP! Please see important information about our web site.